Can a train cross this junction? 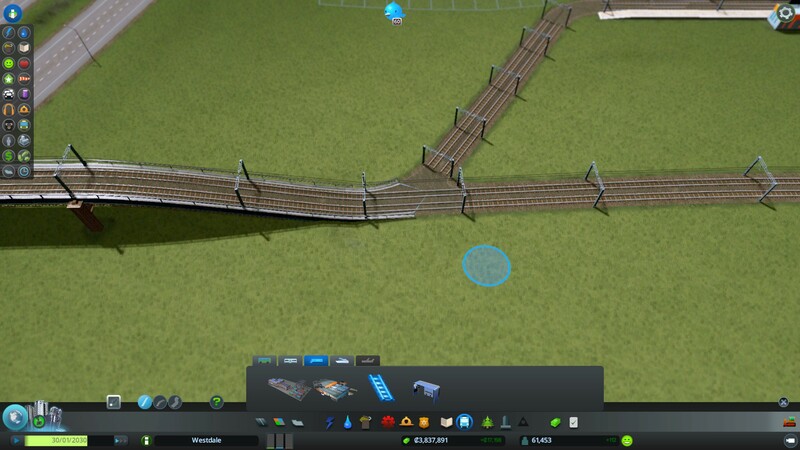 I am expanding my train network to have a go with trains and I've noticed that on occasion the game makes a junction without any track connections. Is this a visual glitch and trains will still use it, or will this break the pathing for trains? I believe it's caused by the junction joining at too steep an angle, but I'm not sure. I watched a few trains using this station and none made any use of this track and all ignored it. Based on this I think it's safe to assume that this is not a visual glitch and in fact you do need to ensure that the rails are connected in order for a train to be able to find a path. Without assuming it's defenitely the case that no train can ever use this track because of the missing rails. Unfortunately this happens when building tracks and without looking carefully at the track you will never notice it, there is no "alerting" by the game about this. Not the answer you're looking for? Browse other questions tagged cities-skylines or ask your own question. How can I make the zoning colours more distinct? Rail traffic is backed up trying to leave my city. Is there anything I can do? Can Chirper messages be limited to only relevant messages? My highway is backing up. What can I do? How can I stimulate Industrial growth? Can cargo trains and passenger trains share the same line? Must I have cemeteries / landfills or can I use crematoriums / incinerators exclusively?